One of the most asked questions I get on social media is where I get Emsley’s bows from. You might notice that I very rarely post a picture of her on Instagram without a bow on her head because honestly, she is always wearing one! She has recently learnt how to put them on herself so that has also been working in my bow-wearing favour! Since we found out that our little pumpkin was going to be a girl at 20 weeks pregnant, I made it my mission to find the best bows I could for her. We have collected our fair share of bows since then and after getting the chance to try them all out over this past year I feel like I can finally share my favourites! Each day this week I will be sharing one of my favourite small shops who make bows, because I have never actually purchased a bow from a large company store. Etsy and Instagram have been my world to find the best made bows for Emsley! So to kick off ‘bow week’ the first shop I am sharing with you is a store called “Elle Bowtique“. I found this shop while I was still pregnant when the shop owner Michelle was offering a very generous package in an auction to help out a family in need. I ended up winning the auction which then began my love for her bows! She is a busy mom of three who is dedicated to her online shop. Over the past few weeks, she has updated her website as well as added some new styles of bows! I am very excited to try out her new “Linen” bow and “Elle” lace covered ones. 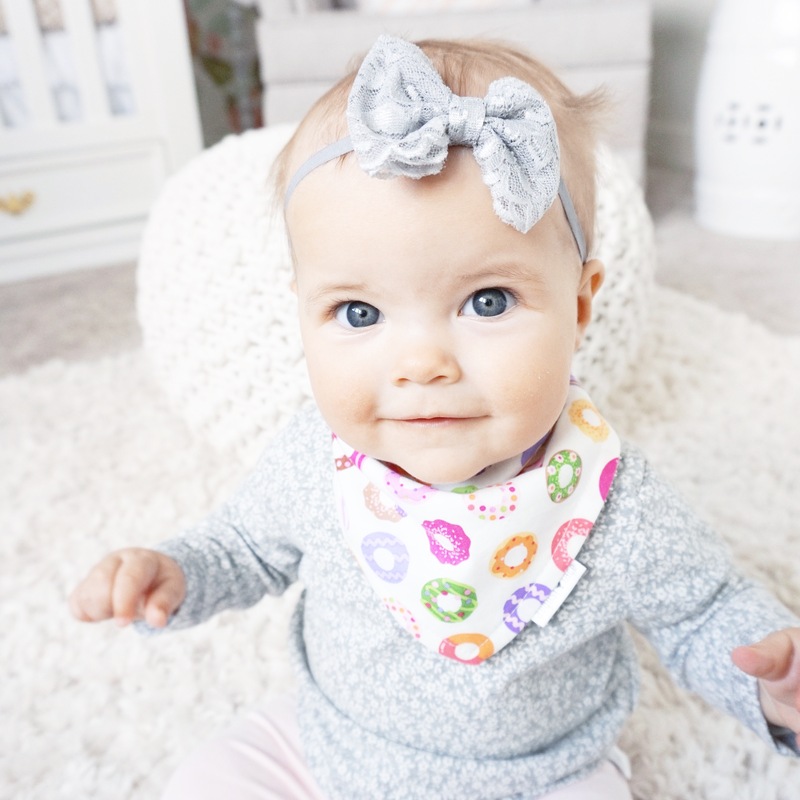 While I wait for my new bows to arrive, here are some pictures of Emsley wearing our current Elle Bowtique favourites! Michelle makes these lace ones in two different styles, either with a lace band or with an elastic band. The one above is with the elastic band and is called “Cora“, and the one below shows the lace band style. The one below also comes in a variety of sizes. The one Ems is wearing below is called “Kinsey” on her site. This headband is not a classic bow style but I love it for a little extra glamour, it’s called her “Gypsy” headband and is super adorable. I love the sparkle in it and I feel like pictures don’t do it justice! I have this style called “Flora” in both colours (ivory and pink) but the pink one is still a bit big on Ems. Again, it’s not the typical looking bow but I think that’s why I loved it so much over this past spring and summer. The flower design with gold detailing is different than anything else we own and just like the gyspy headband, adds a bit of sparkle! She still fits this ivory coloured one so we are wearing it a lot right now with her fall clothes too! Michelle is being incredibly generous and is offering all my readers 25% off her entire site, including all her new styles! Just use the coupon code AUGUSTLACE at checkout to receive the discount. The coupon code expires on Sunday October, 16. She is also hosting some giveaways this week on her Instagram (@ellebowtique) and Facebook pages, so give her a follow on both to get the latest information on her new releases, giveaways and promos!